Government forces and rebel troops are rearming and recruiting for conflict in the east of the Democratic Republic of Congo, the BBC has learned. US and European Union officials are warning the situation is increasingly tense despite a January peace deal. One source said six plane-loads of arms and ammunition had been flown into Goma by the government in the last 10 days. The defence minister refused to confirm or deny allegations the government was moving weapons into eastern DR Congo. Chikez Diemu said it was an internal matter for the authorities to deal with. Human rights groups say that tens of thousands of people have fled as the situation in the area deteriorates. At the end of January a peace deal was signed in Goma between the government and the variety of groups that have fought for control of the lush green forests of eastern DR Congo. It was supposed to have seen the disarmament of groups and their integration into the army. Anneke van Woudenberg, of Human Rights Watch, who has returned from the area, warns that the peace process is now under threat. "The peace process is very fragile and shaky," she said. "What we're seeing is re-recruiting and ongoing attempts by different armed groups to continue with the military option." Alan Doss, the UN special representative for DR Congo, told the BBC that peacekeepers in the region were anxious about the situation. "When you have armed groups in close proximity to each other and where we are not making progress on the political process, the risk of an accident is always there and, of course, things can spiral out of control," he said. The level of violence dropped after the Goma peace deal, Mr Doss said. "The problem is that in the areas that they control, violence against civilians of various kinds - and especially sexual violence - has continued, so that is a big worry." He also said it was hard for peacekeepers to monitor re-armament in isolated parts of the country. On one side there are the forces of General Laurent Nkunda - Tutsis with traditional links to neighbouring Rwanda. On the other side is a loose coalition of forces - among them the Hutu FDLR, former members of the Rwandan army who fled to DR Congo, after participating in the genocide of 1994. Alongside the FDLR are a variety of groups, including a local militia called the Mai Mai, who supported the Congolese army during last year's disastrous attempt to crush General Nkunda by force. These groups have been participating in the peace process, though the FDLR was not at the negotiating table in Goma. But Tim Shortley, the US senior African conflict adviser and a witness to the Goma peace deal, warns that the peace process is now in danger. "We're very concerned about what appears to be preparations for renewed conflict," he says. General Nkunda and his CNDP force "have been playing with the Goma process unfortunately", he adds. "I think that they are ultimately afraid to disarm and to demobilise and they want to hold on to the land that they have through military means." It now appears that General Nkunda is not just touring his area and strengthening his defences. 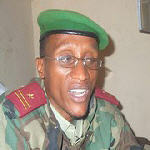 There are reports that he is recruiting fresh forces - and not just in the area of eastern DR Congo that he controls. He is reported to be recruiting in Rwanda and Burundi. But he is not alone in preparing for a new round of fighting, given the six plane-loads of arms and ammunition recently flown into Goma by the government. Meanwhile, Ms van Woudenberg says the Congolese army continues to support the Mai Mai groups and the FDLR. "This of course raises serious questions about the government's commitment to the peace process in eastern Congo," she says. The European Union, which also witnessed the Goma peace deal, is now working hard to try to prevent an outbreak of fighting. Roeland van den Geer, the EU's representative in the Great Lakes, said that as all parties continued to arm, he had spoken to those responsible for army operations. "I have underlined, as I did a few days before in Kinshasa, that in the view of the international community an armed offensive against the arms group would be disastrous," he said. "Those responsible for the army in the east have underlined that there are no plans for a military offensive." It does not look as if war is imminent. But clashes since January's peace deal already drove 100,000 from their homes, and with the situation as tense as it is now, any incident could spark off a fresh round of fighting.